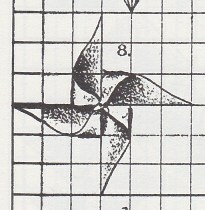 This page attempts to record what is known about the origin and history of the Cut and Fold Windmill. Please contact me if you know any of this information is incorrect or if you have any other information that should be added. Thank you. There are (at least) two entirely different folded paper windmill designs. To distinguish between them I call them the Cut and Fold Windmill and the uncut Windmill. 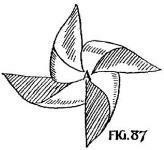 There is mention of a paper windmill on page 83 of 'The Mottoes and Commentaries of Friedrich Froebel's Mother Play', published by D Appleton and Company, New York in 1895, which is a rendering into English of a work by Froebel first published in German in 1844. 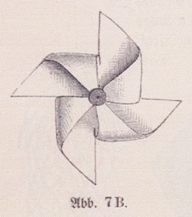 The English text contains the sentence 'Hearing the sound, out runs a little boy with his paper windmill. It turns faster and faster as he increases his speed.' This would seem to be a description of the Cut and Fold Windmill which works much better as an action toy than the uncut version. As far as I am aware the first diagrams for this design appear in 'Des Kindes Erste Beschaftigungsbuch' by E Barth and W Niederley, which was first published in Bielefeld and Leipzig, and the foreword of which is dated October 1876. There is a drawing of the Cut and Fold Windmill in Eleonore Heerwart's 'Course in Paperfolding' was first published in Dutch in 1895 then in English by Charles and Dible in London and Glasgow in 1896. 'Froebel's Occupations', written by Kate Douglas Wiggin and Nora Archibald Smith and published by Houghton, Mifflin and Company, of Boston and New York in 1896 includes the observation 'In the firelit winter evenings, before the days of the useful (and ugly) match, our grandmothers folded dainty lamplighters ... and when the pretty work was over, marvellous paper boats and boxes and windmills were fashioned for the expectant audience. 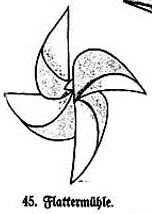 Many times in the quiet home-life of the German peasant Froebel ... saw parents and children united in this simple art ...' Unfortunately we cannot know which design of paper windmill is being referred to here. 'Le Livre des Amusettes' by Toto, which was published in Paris by Charles Mendel in 1899. 'Paper Magic' by Will Blyth, published by C Arthur Pearson in London in 1923. In Margaret Campbell's 'Paper Toy Making', published in London by Sir Isaac Pitman and Sons Ltd in 1936, where it is called 'Revolving Windmill'.